With changing climate conditions many regions have become susceptible to drought. At the request of our drought-vulnerable customers, Heirloom Organics has introduced the low water, drought-resistant complete garden-in-a-pouch. This complete drought–tolerant garden contains 24 varieties, over 65,000 (10 ounces) of seeds, delivering a wholesale quantity of seeds in a very inexpensive, complete garden set. Scientists are calling for increasingly warm, dry conditions around the globe. Faced with that certainty, many gardeners are looking at methods of conserving water or looking for drought resistant vegetables, varieties that have evolved into growing in hot and dry realms. What types of drought tolerant vegetables work best in a low water garden and what are some other tips for growing low water vegetables? Heirloom Organics has solved this problem for you with the complete Low Water Garden in a pouch. Drought has always been an issue for human beings. Farmers and gardeners, even 10,000 years ago have always considered drought to be among the most serious of concerns. We cannot know when a drought will occur, and by the time drought is upon us it is too late to plant drought-resistant edible plants. 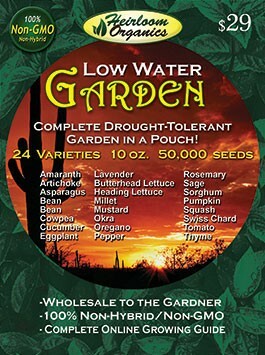 Prepare now for the potential of drought with the Low Water Garden in a pouch.